The call of the first disciples is followed in Luke by the cure of a leper and then of a paralytic. Then there is the call of Levi (called Matthew in Matthew’s gospel) and the discussion with Jesus about his mixing with sinful and unclean people. It is the first of many confrontations between Jesus and the Jewish leaders. We then come to today’s reading. Some scribes and Pharisees want to know why, when their disciples and those of John the Baptist regularly fast, Jesus’ disciples “eat and drink freely”. We know that John grew up in the desert and lived on an austere diet of locusts and wild honey. He also preached an austere penitential message and lived a highly disciplined life. The Pharisees also led a highly regimented and strict lifestyle. Jesus, however, together with his disciples, is frequently seen eating at the tables of Pharisees and tax collectors and in the houses of friends. But, while Jesus rejected ostentatious fasting, we know he fasted (once for 40 days) and praised it together with prayer and almsgiving, provided it was done discreetly and not for display. Jesus gives two answers to the question. First, he says that it is not appropriate for guests to fast when the bridegroom is still around. A Jewish wedding was and is a specially joyous occasion (plenty of wine needed, as we see in Cana) and it could last for a week. It would be unthinkable to fast at such a time. Here Jesus is the bridegroom. There will come a time when he is not physically with his disciples and then they will fast. The second reason goes deeper and is presented in the form of a parable. One does not use a new piece of cloth to patch an old garment. At the first sign of stress, the new cloth will be stronger and the old cloth will be torn. Nor does one put new wine into old wineskins. The new wine is still fermenting and expanding. The old wineskins, which are made of goatskins, are already stretched and no longer flexible. When the new wine expands, the old wineskins will not be able to stretch any more and will burst. The result is lost wine and ruined wineskins. 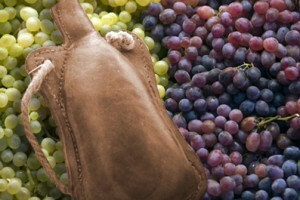 So new wine has to be poured into new wineskins. In this Jesus is clearly saying that his whole vision of religion is new and it can only be accepted and adopted by people who are prepared to see things in a new way. His teaching, his vision cannot be grafted on to the old religion. The old religion emphasized externals like observance of legal and ritual regulations and fasting; Jesus emphasizes the interior spirit which is the real measure of a person’s value. This parable may also be read in conjunction with John’s account of the wedding feast at Cana where Jesus produced new and better wine from the water in the ritual washing jars. Jesus knows the difficulties his adversaries face. “No one, after drinking old wine, wants new. He says, ‘I find the old wine better’.” Those who had grown up with the ‘old wine’ of the Mosaic Law would find it difficult to switch to the ‘new wine’ that Jesus was offering. In our Church today there are many who still hanker for the ‘old wine’ of pre-Vatican II days. They have not made the inner shift which is necessary. They have not understood that Vatican II was much more than a change of external practices (such as have taken place in the liturgy). They nostalgically long for the Tridentine Mass in Latin and compare it favourably with the “new” liturgy which they find superficial and lacking in reverence. But they do not seem to have grasped the thinking which is behind the liturgical changes. The new patch does not fit their old cloth. “The old wine is better,” they say. The new wine will not be appreciated until the wineskins are also changed; otherwise we are in the same situation as the Pharisees were with Jesus. Next articleNew wine into old wine-skins!